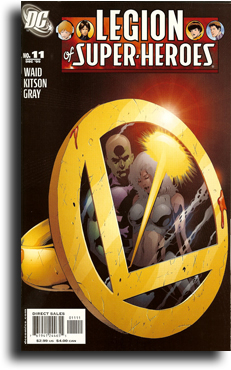 I keep trying to drop this book but the team working on the book has made the Legion interesting again. Granted the story telling is a little slow at times, but the trip so far has been well worth it. The foundation is being set up so that new readers do not have to be scared of 30 years worth of continuity. Some of the other good things about this book, each issue has a roll call of sorts, so the reader can tell who is who, and most issues have two features, the main feature and a back up that is either a story in and of itself, or a letter column that is illustrated. 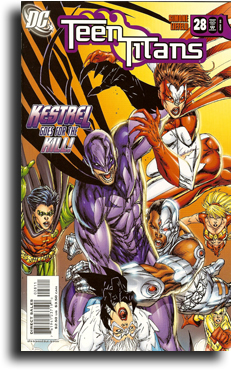 Last issue we were faced with a death in the ranks and the team is split across time and dimensions and trying to find a way to save the home worlds of the legion members. Worth checking out although some catching up may need to be done as what seems like this story arc seems to be drawing towards a conclusion. I miss my Spider-Man, granted he still faced traumas and challenges but it wasn't a freaking soap opera. At least not at the level it is today. I think part of the problem for me is that the art just doesn't work for me. The dark shadowy figures just make the mood, however light, dreary. The saving grace of this issue is the writer. Peter David is one of my favorites and I enjoy the interplay between tracer and Aunt May. Otherwise I wouldn't be too happy with it. I could repeat my rant about the avengers appearing more in a spider book more than their own, but the two of you who read these reviews know the drill. This is the best looking book on the whole rack. I have never seen a book where the production quality complimented the contents as well as this one. 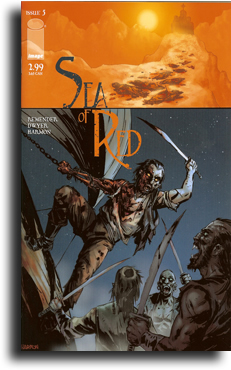 This is a story that combines two genres, vampires and pirates. The last few issues dealt with a man turned vampire that was left at the bottom of the ocean for centuries only to be "rescued" by a film crew. 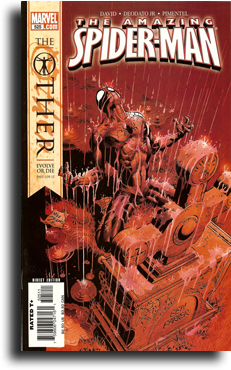 This issue deals with vampires hunting vampires in a search for an urn containing the blood of Christ, their supposed salvation from the curse that hold them captive as vampires. The art is moody and the writing and plotting keep the idea from getting old. Hopefully this book will go on for a while. I liked this issue even less than the last one. While the story was good, the unfinished and exaggerated art by Rob, just ruined it for me. I'm sorry, I try to cut the guy some slack, but I just don't really care for his work. The less said the better. After the ride Geoff Johns put us through in the previous arc, how could the follow up be anything less than a let down? This follows what is left of the members of the JLA, while not a team, they are still trying to come together and put something in place while the trinity. Who know if it will work or not, but it is nice to see a team trying to come together in the aftermath. I also enjoyed the art provided by Derenick and green, nice and clean and not overly exaggerated. I dug the story and art. 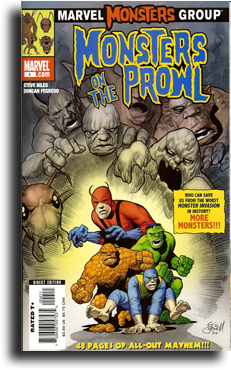 I enjoyed the reprint of one of Jack Kirby's monster stories, what I hated about this book and most of what has been happening in Marvel books lately, is the ad placement. What kind of an idiot gives you such an issue so that the last 10 pages of the book are made up entirely of ads. It made me angry. The cover advertises 48 pages of all out mayhem, more like 33 pages and a veritable boatload of ads. Truly sad. Another stellar issue for this title, again I am sad that it is a bi-monthly but if the quality continues, I won't complain much. 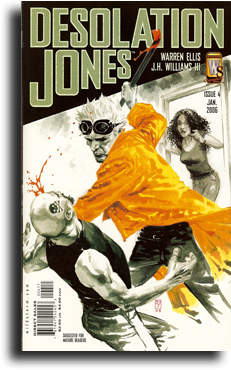 This issue after finding Paula Nigh, daughter of the man who hired Jones to find his precious Hitler film, Jones stumbles on a secret that could, if exposed tear the whole family apart, but it also means the Jones may be looking for something more than just a "dirty movie". The art and pacing of this book is top notch, well worth checking out. Look at the cover; I dare you to tell me clowns aren't creepy. OK fine, read the first three pages, now I dare you. Yup I told you clowns are creepy, this one in particular. Quite a disturbing little tale Mr. Way is telling and Mr. Dillon is illustrating. 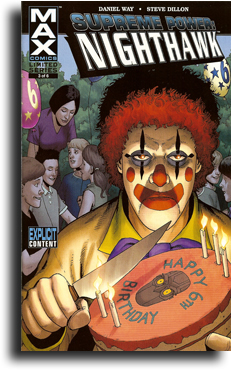 A psychopath escapes and in the process kills a clown that was to entertain at the hospital he escaped from. After killing him, he does what comes naturally, assumes his identity. Meanwhile Nighthawk is trying to track down the source of some tainted drugs that are killing junkies en masse. There are connections that may lead to city hall as well. While the first three pages were quite disturbing, Way's whole story more than offset his initial hook. I'm enjoying this more than Supreme Power the title that spawned this mini-series. I write about this title all the time, always singing it's praises it's almost sickening. Here it is again on my list, but not because I enjoyed the book. Don't get me wrong I did, since it featured two of my favorites, but the real reason I applaud this book is Marvel Comics (who I must admit I have been down on lately) has gone and done something wonderful. 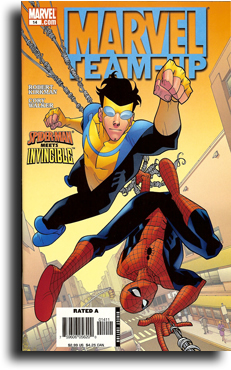 They have allowed Robert Kirkman and the original Invincible team to produce a crossover between Spider-Man and Kirkman's creation Invincible. Why do I applaud them, because they are quietly promoting one of my favorite books that deserves to be read by others, to the point of even referencing issues by number in the footnotes (man I miss those). By somewhat quietly releasing this team up, it allows further exposure to both Kirkman's creation and hopefully Image Comics (not that they need it) and may lead people to some of the better books on the stand today. Bravo Marvel for letting this take place. Well with the 500th review behind us, we are continuing on. Over the course of the past 18 months this has gone from a 3 man operation to a one man show. I'll try to update the pages on a somewhat regular basis, but I would anticipate a bi-weekly schedule for the reviews. The shipping lists will be updated weekly and other features will be added probably in the off review weeks. Look for a write up on the screening we went to for the movie "Stump the Band" (thanks Chris), and some more interviews. Thanks for sticking with us.